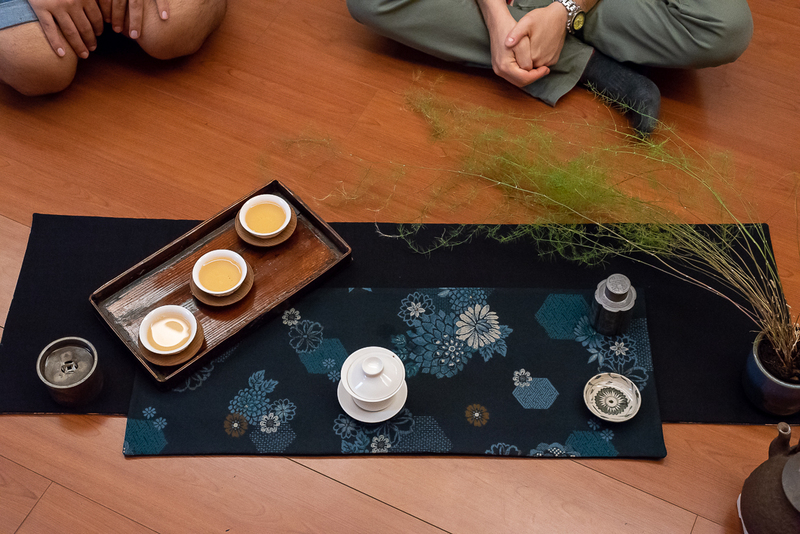 Last week, I gave a tea class about Chaxi. I started with the theory contained in Teaparker's book 'Chaxi - Mandala' that was published 10 years ago. Then, I proceeded with some practice. 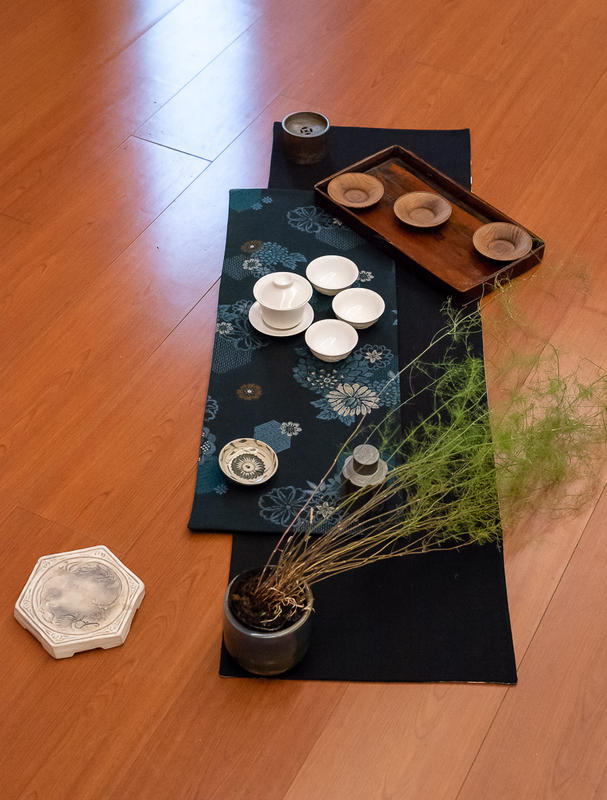 I brought all the above tea ware and the Chabu below so that my students could create their own Chaxi and use it to brew tea. This was one of the most interactive and creative class I ever did! The mandala concept is very helpful to explain what a Chaxi is all about. It's creating a universe, a perfect world where each little part is connected to the whole with the purpose of making good tea. It has been called practical beauty, a multimedia performance involving all 5 senses. Literally, Cha Xi means 'tea play' where 'play' has the meaning of a theater play, a performance. We could go on about the theory and abstract meaning of a Chaxi for several paragraphs and the longer I'd write about it, the more philosophical and less comprehensible my text would be! Let's start with the beginning: the tea. It's like the story of your theater play. This is the backbone of what you want to express, what you want to perform. So, I started by letting my students choose a tea. I gave them the choice between a spring 2016 Tsui Luan high mountain Oolong and my 2017 spring old arbor sheng puerh. Both chose the Oolong, because that's the kind of tea they drink most (in Taiwan!). The second item I asked them to select is the Chabu: this piece of textile is the background to your performance and its colors are going to create the atmosphere of your tea moment. 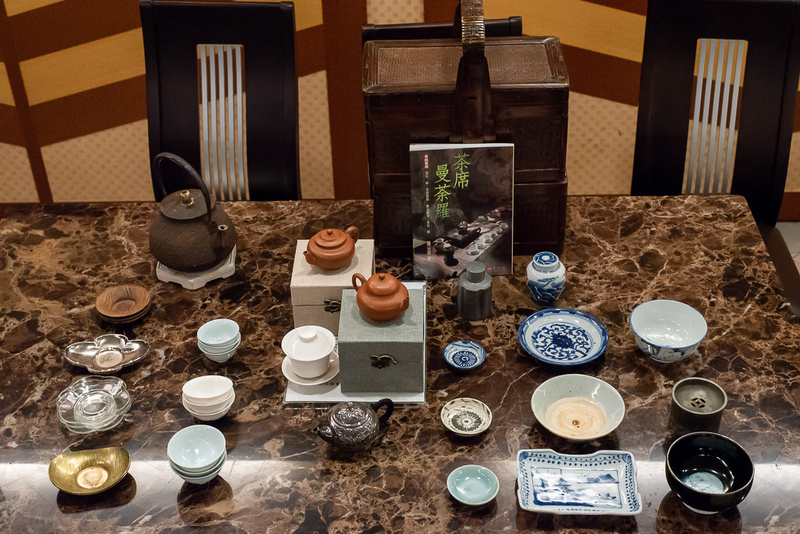 The third item to select is the tea vessel (teapot or gaiwan). This is your lead actress! She must be chosen with great care. Her job is to be in harmony with the world you are creating and the tea you are going to brew. Then, choose the other accessories you'll need with the same double constraint: that they fit the Chaxi aesthetically and practically. And choose a plant or flower to add connection with nature and a touch frail beauty that reminds us that life is short and precious. Then, place your accessories on your Chabu. The brewing vessel is in the center, because it's the most important ware. Next come the cups, the kettle, the jar, the tea display plate and the waste water bowl. Everything must be within the reach of your right and/or left arm. It must be close enough that you don't need to get up during the tea brewing. Here a few comments on Antonio's Chaxi here on top. You may have noticed that the qinghua cups were not included in the wares I had prepared. These are cups that he had brought (I allowed the students to bring their own ware). They are from the 1980s and are made with good quality porcelain. However, they are tall and have thick walls. This underlines the thickness of the taste and preserves the heat longer. For that reason, they are more suitable for winter than for summer. 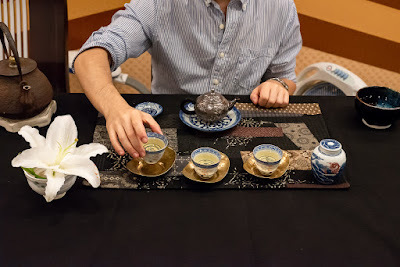 On this dark and complex Chabu, these cups made sense, though, because this Chaxi's theme is more depth than lightness. High mountain Oolong can express both depth or lightness. It depends how it is brewed and with what. In this regard, while the silver teapot looks nice here, it produces very light aromas. It would have been better to choose the Yixing zhuni teapot! Let's turn to Manuel's Chaxi. Manuel is a tall fellow and it's interesting to see that his teapot is much farther from his body than Antonio's. There's no set rule for the distance between the brewer and the teapot. The only principle is to feel comfortable when preparing the tea and pouring in the cups. 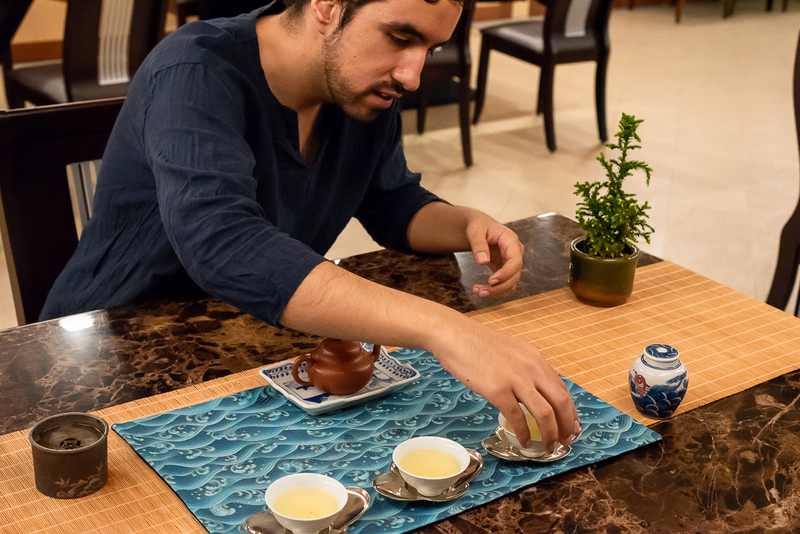 With this Blue Waves Chabu and a bamboo mat with sand color, Manuel wants to emphasize the fresh energy of the high mountain Oolong he's brewing. The choice of the celadon singing cups and bright Chatuo makes sense to underline the light aromas. The carp jumping out of the water jar is also a nice touch on this setup. The qinghua plate under the teapot features a water and mountain landscape is also OK. 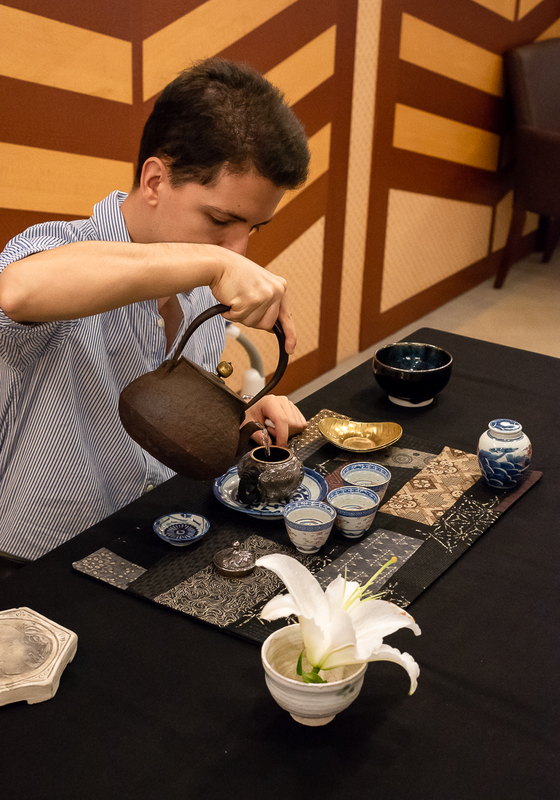 However, the Yixing zhuni teapot produces a thick taste and it would have been better if Manuel had switched his teapot with Antonio! The silver teapot would have looked cool and would have produced lighter aromas that would better fit the Blue Waves feeling of this Chaxi. Manuel and Antonio were curious about my spring 2017 wild top old arbor sheng puerh. 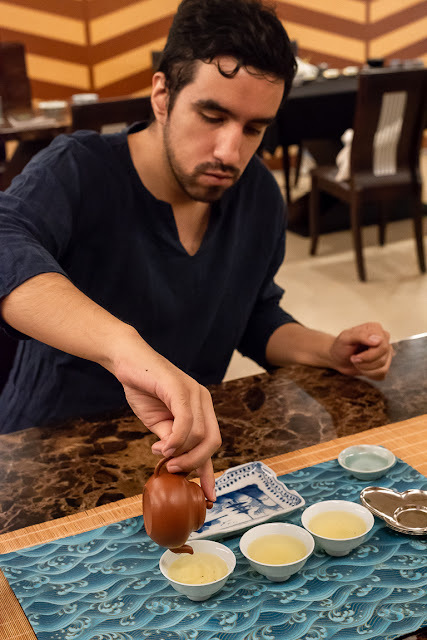 It's a very unique gushu puerh, because it comes from a remote forest with (at least) 500 years old trees that had never been harvested to make tea in modern times! 2017 was their first harvest. So, to satisfy their curiosity, I made my own Chaxi with the accessories they didn't use. And, unlike them, I decided to set up my Chaxi on this wooden floor. There's nothing wrong with a Chaxi on a table, but I wanted them to experience how it feels on the floor. It's the way many people (including myself) prepare tea in Asia. There's one practical advantage: there's less risk of breaking porcelain when you're so close to the floor! Since I was brewing a new tea for Antonio and Manuel, I thought it's best to use a neutral porcelain gaiwan to discover this tea. 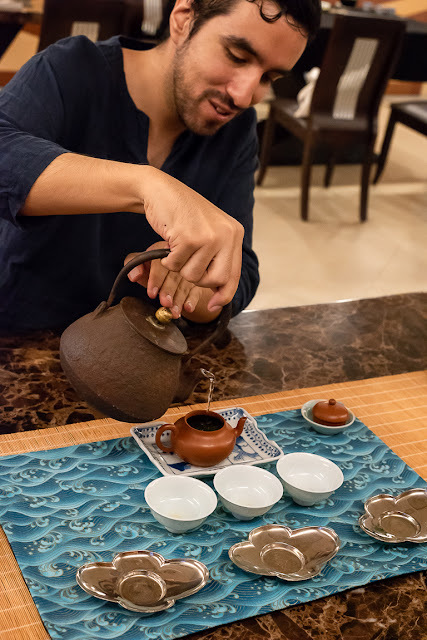 The gaiwan is a great tool to learn about tea and is very useful in a tea class! 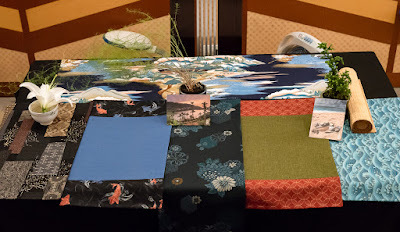 I used 2 Chabu: a long one on its black side and this Turquoise Flowers. Raw gushu puerh is pure and powerful. Even young, it has darker notes (than Oolong). The wood chatuo and old presentation plate for the cups (taken from my old bamboo basket) are echoes to the old puerh tree. The plant on this Chaxi is rather wild, but has very fine leaves. This sums up this puerh! 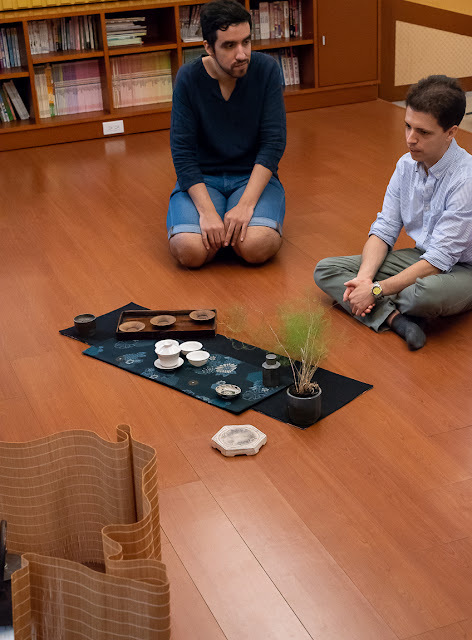 (Above, you can also see that I used the bamboo mat as a screen so that the guests don't see the modern induction plate on which the tetsubin is heated). With this Chaxi I go back in time to the early beginning of this blog. The Chabu is one of the first my mother made for me. And because this blog has connected me to so many generous, amazing, wonderful tea friends around the world, I am using tea ware made by potter friends (Michel François, David Louveau, Petr Novak). It's a mix of new cups and old mini plates. 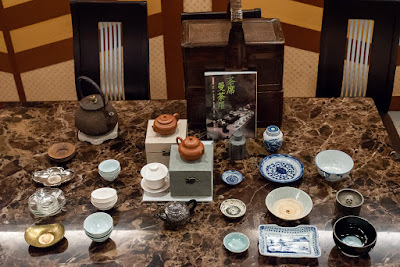 A mix of Chinese Yixing, Japanese tetsubin, Western porcelain and Taiwanese tea because tea has no bounds. I made a big mistake in the first brew and a small one in the third. These humbling incidents are reminders that I still need to practice daily to master the art of brewing tea. The second brew is the smoothest and, this is no coincidence, it's also the brew that tasted the best! 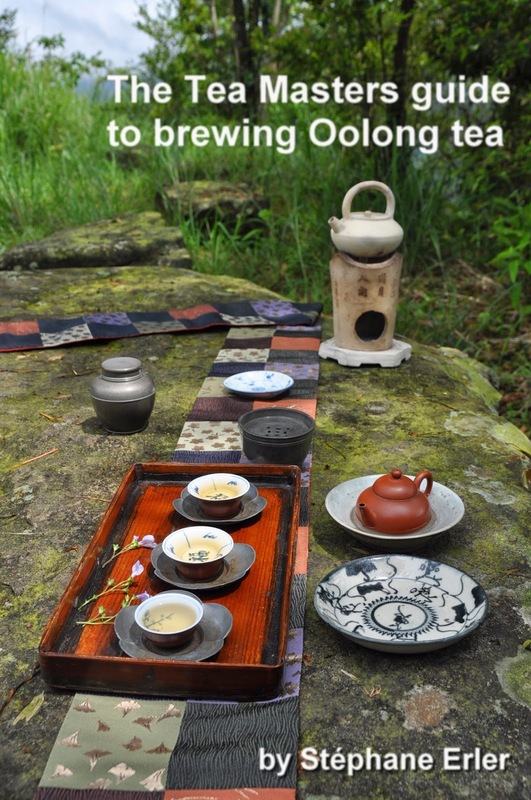 To celebrate this milestone of 2000 posts, I have discounted this spring 2018 Tsui Feng Oolong along with other teas on my online boutique (until the end of August). En revanche je suis étonné de la façon dont tu verse l'eau sur les feuilles lors de la première infusion... j'aurais utilisé moins de feuilles et un débit plus important sur les parois de la théière, tu peux m'expliquer ? 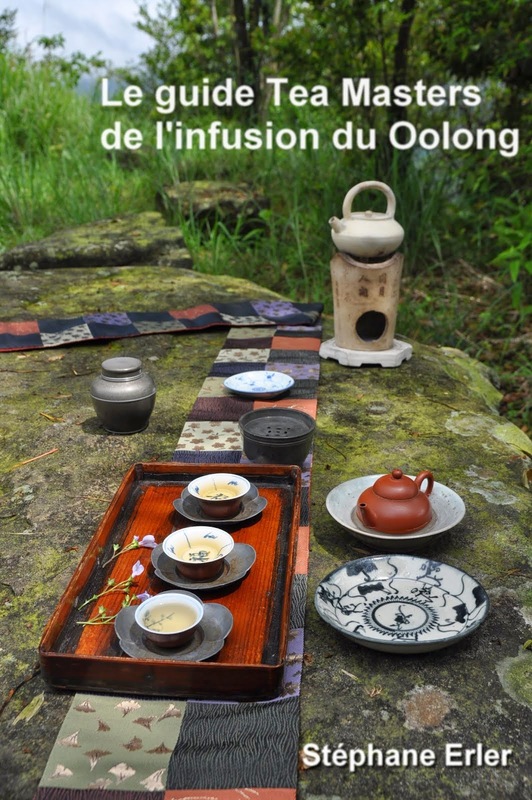 Le principe du Oolong de haute montagne est que les feuilles ouvertes remplissent tout le volume de la théière, confortablement, sans être à l'étroit. Ma quantité de feuilles a permis cela (car cette théière est relativement grande.) Pourquoi lentement lors de la première infusion? En effet, le bon sens veut qu'on utilise de la force avec les Oolongs frais roulés en boule. Si je ne l'ai pas fait, c'est car cette théière zhuni garde particulièrement bien la chaleur. Cela lui permet d'ouvrir les feuilles malgré un débit lent. L'avantage est plus de finesse dans les arômes ainsi (tout en ayant les feuilles ouvertes). C'est pourquoi j'ai versé l'eau bouillante sur la théière. Je comprends mieux, merci. J'ai noté aussi que tu verses sur les feuilles en ramenant le flux au centre de la théière. J'avais relever ce fait lors de notre dernière rencontre mais c'était avec des hungshui et une fois que les feuilles baignait dans l'eau. Tu utilises ce même principe dans cette vidéo ? Toujours pour favoriser l'ouverture ? Enfin, tu parles d'une grosse erreur dans la première infusion, mais je n'arrive pas à l'identifier... peux tu me l'expliquer ? Je distribue le flux partout pour toucher toutes les feuilles. Concernant l'erreur, affiche tous les commentaires sur la vidéo. J'y ai expliqué quand se passe mon erreur. I explain when the mistake happens. For the third brew/video, I left 2 drops of tea on the Chabu. That's because I didn't pour so well in the cups. Thanks for your kind comment, David!